Northern Ireland’s top law officer has called for an overarching investigation to be carried out into allegedly linked IRA murders in south Armagh during the Troubles. Attorney General John Larkin has written to the Director of Public Prosecution (DPP), urging him to consider a fresh probe into the killings, which took place between 1973-1989. His intervention comes at the request of the Family Research and Policy Unit (FRPU), a Co Armagh victims’ group set up to investigate Troubles-related killings. The group is spearheaded by victims campaigner Willie Frazer, whose father Bertie was shot by the IRA in 1975. His death is one of many unsolved murders the FRPU is asking the PSNI to look into, with the FRPU claiming the killings are all linked. 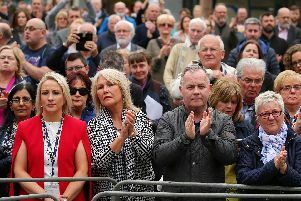 Others cases include the murders of five Orangemen at Tullyvallen during a lodge meeting in September 1975, and the Kingsmill massacre, in which ten Protestant workmen were gunned down by the IRA on January 5, 1976, as they returned home from work. The Public Prosecution Service said the correspondence is “under consideration by” the DPP. Welcoming the Attorney General’s involvement, Mr Frazer said the FRPU would continue to campaign for a “properly resourced investigation into weapon and suspect linkage” between the killings. The PPS said there are certain circumstances whereby the DPP can direct police to investigate a particular matter.